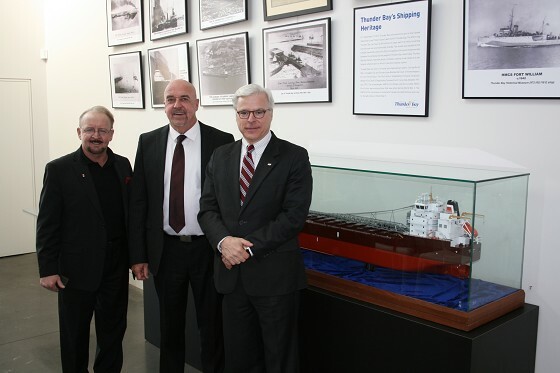 Representatives of the City and Canada Steamship Lines (CSL) today unveiled a 2.4-metre long model of the CSL vessel M/V Thunder Bay. The model is on display at Mariner’s Hall. The M/V Thunder Bay, a 225-metre long Trillium Class Laker that can haul 34,490 tonnes of cargo while remaining fuel efficient and environmentally-friendly, arrived in Thunder Bay on September 27, 2013. The model was stored by the Thunder Bay Port Authority while the City prepared the new display. The model and its accompanying display can be viewed at Mariner’s Hall daily between 11 am and 9 pm.